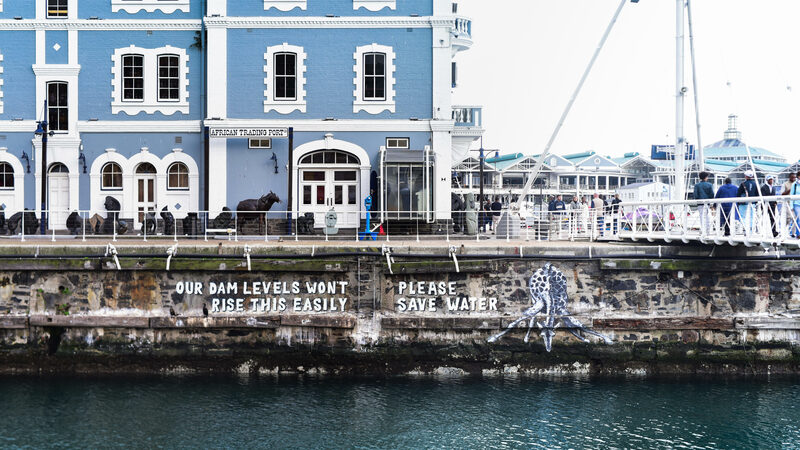 On the 11th May, BAZ-ART was granted the opportunity to collaborate with WESGRO and the V&A Waterfront on one of our biggest interventions yet, creating a mural as a public message concerning the inescapable water crisis in Cape Town. 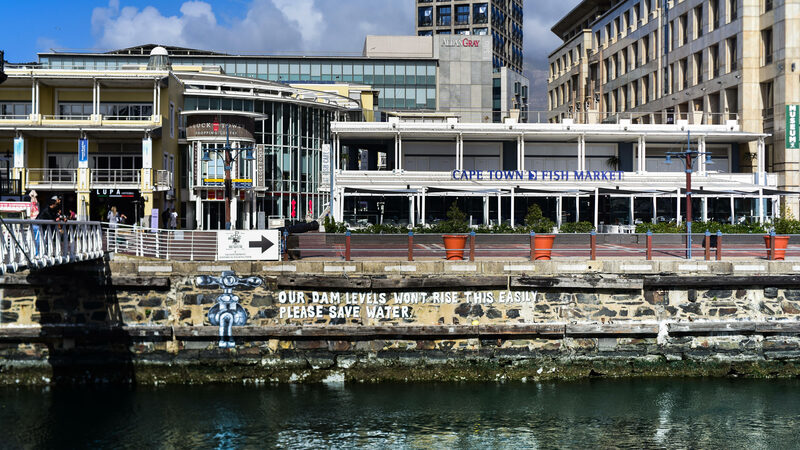 Claire Homeage, also known as Care One Love represented BAZ-ART to create the mural which forms part of WESGRO’s “Waterwise tourism” campaign. Care OneLove is a graffiti artist and illustrator based in Muizenberg, Cape Town. She was part of our International Public Art Festival (IPAF 2018) where she created an illustration depicting a water catchment system, with the aim of reflecting the values of the forefathers of the land, the Khoisan people who were the keepers of water and treated it like pure gold. She is inspired by wild nature and the importance of environmental concerns. The V&A Waterfront is known to be Cape Town’s most visited tourists attraction, banking on thousands upon thousands of visitors daily. The mural was strategically located at the Swingbridge facing the Waterfront’s Clock tower, where the mural was sure to reach large amounts of tourists and local residents making the message all the more powerful. 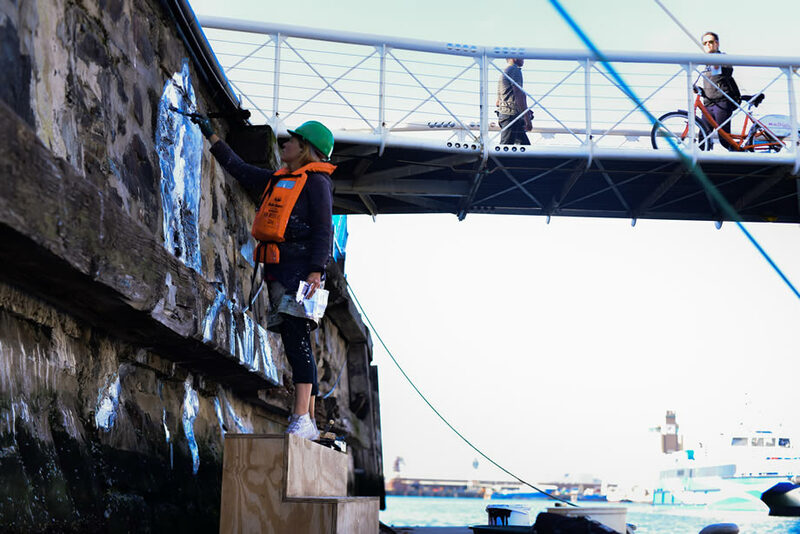 The placement of the mural on the harbour wall creates an illusion with the rising and falling tide which brings the message to life. The giraffe overextends itself to meet the ever descending water level which despite the inaccessibility still remains a necessity for life. On the opposite side, the water facet seems to be dripping, creating an illusion of water merely washing away. Alongside an inscription “Our dam levels won’t rise this easily. Please save water!” urging passersby to be conscious and frugal concerning their water usage. We believe that all these public messaging acts as a resounding gong in human consciousness creating a long-term conservation mentality. The “bright side” to the dryness is that it creates a generation of mindful, consumption conscious citizens. Like those who lived through the great depression still pick up every cent they find on the ground and never let any food go to waste; we too, that are living through scarcity will learn lifelong lessons about the value of things that we once took for granted. Even when water is restored to its natural abundance, there’s a good chance that all those affected by the drought will forever be conscious about wasting the vital necessity. “Every cloud has a silver lining”, I guess in Cape Town, dark clouds itself becomes the silver lining. The ray of hope that bears good news of promised rain in dark times. As a result of drought, Cape Town has become one of the front runners in terms of innovation in sustainability and environmentally friendly practices. Our scholarly teams have been tuned to focus on solutions and alternative ways for the future creating a futuristic water smart city. The water crisis is believed to be the first of many tell-tale-signs of overall human consumption. The world’s population is growing exponentially and soon the human species would need to change its ways or simply suffer the consequences. As a city, we are proud to share these values, imprinting waterwise behaviour on the minds of all who crosses our shores. Through public art, we are proud to be part of the waterwise tourism solutions.